The Pioneer DJM-S3 Serato DVS Mixer offers a new entry point to the Serato specified series. Complete with professional features derived from the top of the line DJM-S9 mixer, you'll find a Magvel fader, independent channel filters, 24-bit audio quality with dithering technology and much more. 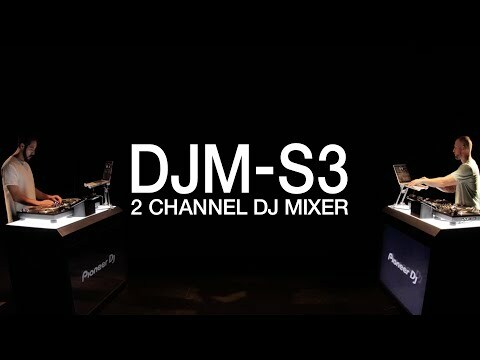 Because the DJM-S3 has a built-in Serato-dedicated sound card as also found in the professional DJM-S9 mixer, you can connect the DJM-S3 to your PC/Mac with a single USB cable and begin mixing with Serato DJ straight away. Mix and scratch all of your digital media via turntables and the Serato Control Vinyl, or by using compatible multimedia players. The audio output of your music will be second to none thanks to the DJM-S3's 24-bit audio engine with dithering technology commonly used in audio mastering. Scratching should feel instinctive and effortless, so to accomplish this the Pioneer DJM-S3 utilises a Magvel crossfader for an ultra-smooth response. Equally of good quality are the independent channel filter knobs that have the perfect amount of resistance whilst you create unique textures with resonance. The connectivity on the Pioneer DJM-S3 is also designed to work with any club PA or home audio system giving you connections for XLR, RCA and headphones as well as an independent microphone input so that you can use a microphone and the Aux input at the same time. There is even a signal GND terminal for easy attachment and secure holding for ground wires from analogue turntables. The Pioneer DJM-S3 Serato DVS Mixer is powerful enough for professionals and remains affordable and intuitive enough for newer DJ's to use with ease. Made by one of the best names in the business the Pioneer DJM-S3 has got your DVS Mixing needs covered.